It was quite difficult to hear. 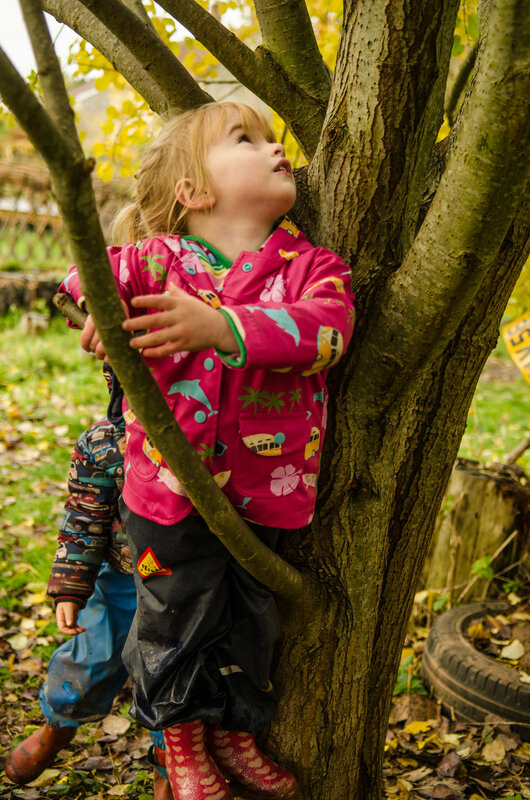 My Forest Schoolers rarely dishearten me over things they might mention during the sessions but one had stopped on the Timber Trail on one particularly wet Forest School session. I could see he wasn't ok by the look on his face, so I asked if he could tell me what was wrong? “I am USELESS!” he shouted! And he repeated it several times, his fists clenching and the crossness in his voice growing with each shout. I asked him why he had come to this conclusion and it came down to him not being able to complete the Timber Trail on his own because it was slippery. 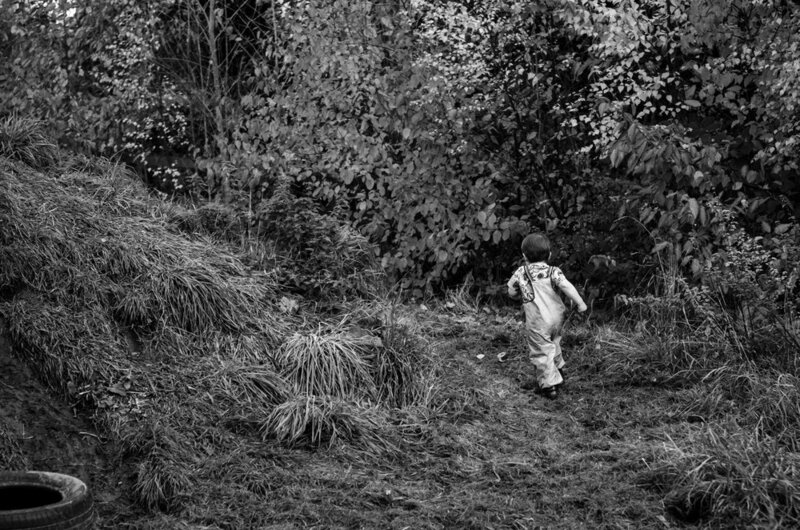 He knew he wanted to complete the Timber Trail, he wanted to do it on his own, but he also wanted to not slip over and that was making him anxious, which manifested itself as anger. Unless you have been hibernating in bed, you will hopefully be aware that the weather has definitely got colder and soggier. Very cold. Very soggy. We have been anointed from the heavens with a few heavy sharp showers recently, (which of course we don't mind) but it does make for a somewhat riskier play space. With this in mind, I thought it would be good to draw the children's play mindset from the relative freedoms of Summer into the colder, wetter wintery climes. 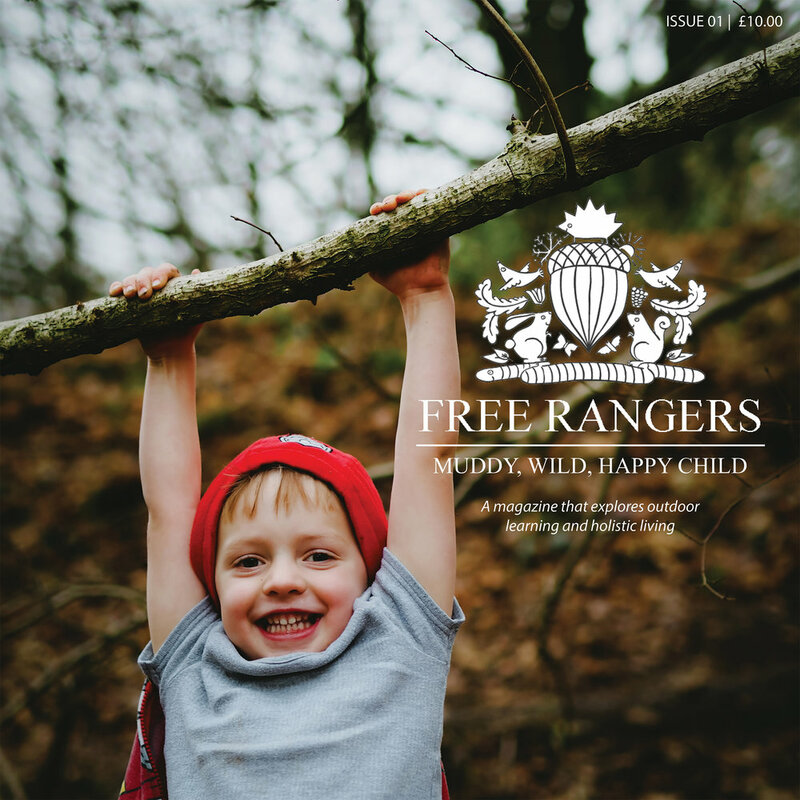 At Free Rangers, we have a lot of wooden buildings, climbing logs, planks, a mud hill and other features the children have lots of access to. To be able to give them the freedom to move independently and to limit the amount of adult interaction, it's important to coach the children on safe navigation whilst it's wet. 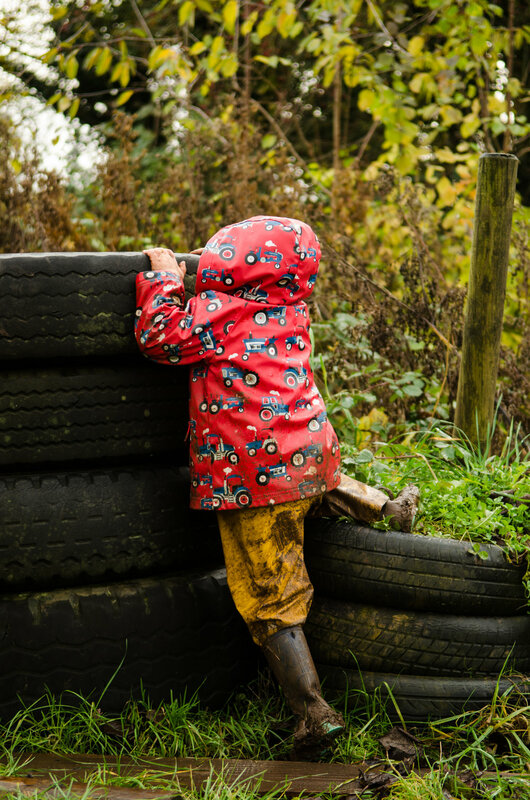 Over time they build up their own risk assessment strategies whilst they play which, once developed, can be applied to other areas of their play. 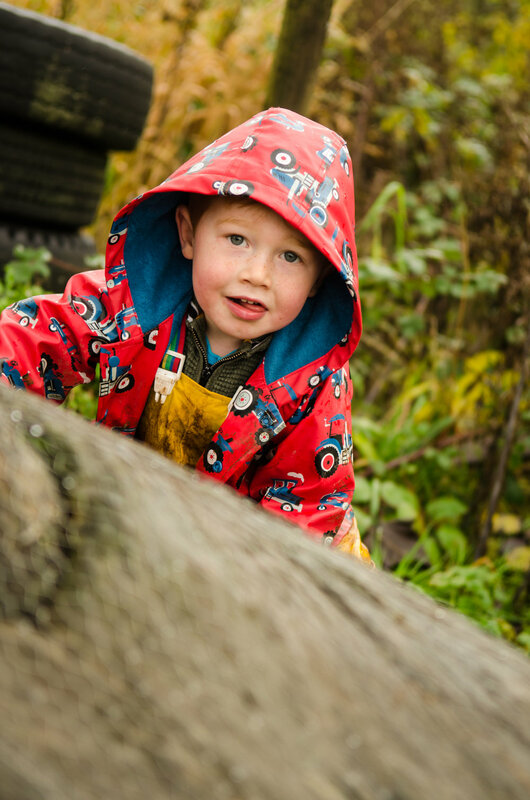 When approaching safe navigation during wet play, it's important to 'arm' the children with the right knowledge and awareness of the hazards as they climb and move. We are big proponents of not saying "Be Careful!" because that is of no use to a child. You're not giving the children any important information other than you have no faith in what they're currently doing and will probably end up scaring them, confusing them, or making them lose balance or concentration! The languages we use around children (body language/spoken language) are incredibly important and the children infer a great deal of meaning from even the smallest of messages. So what to do instead? The strength to achieve. The joy of succeeding. 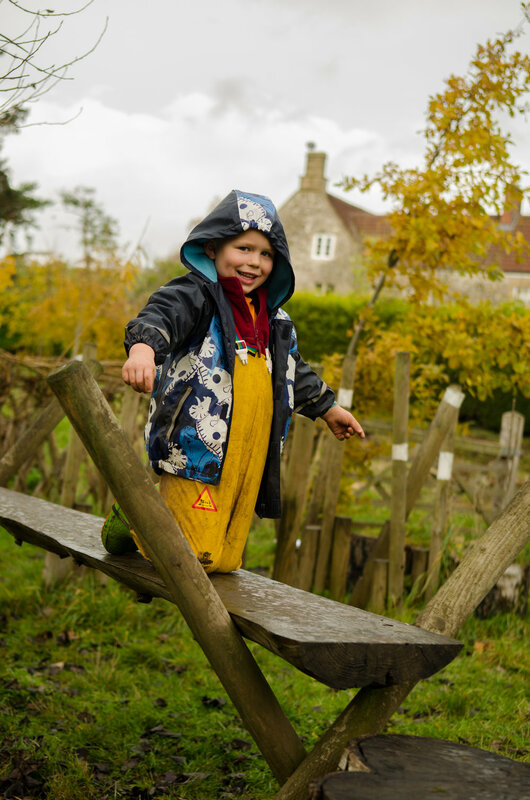 As aforementioned, if the children are given the correct tools they will be able to safely approach risks in their play far more safely because they will have developed risk management strategies, largely independently, which will mean their play will be safer, stronger and far more beneficial as a result. So how to arm the children: Firstly, we need to inform. 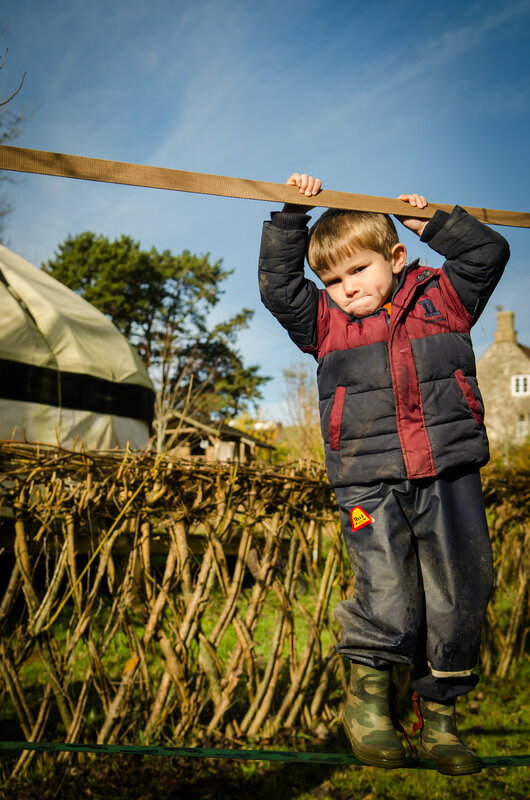 Over these past weeks, the children have been getting stuck in with the slippery logs and slacklines out in the paddock. 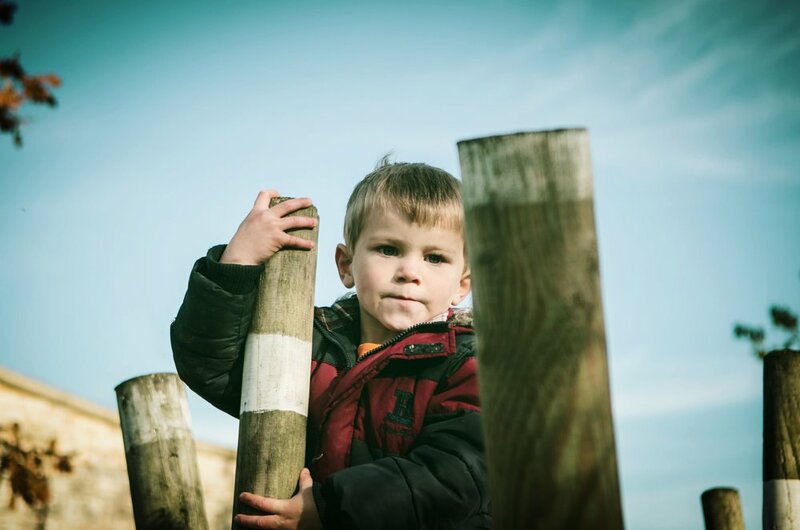 When they approach the different sections, be it the high bridge, the stepping posts or the logs, we simply give the children the facts: Have you noticed that log is icy? Will it be slippery? I wonder what the best way to get across would be? Should you run or walk? Can you see your friend is also on there? These statements shouldn't come with emotion or expression. They are simple statements designed to get the children thinking about their surroundings and the movements. 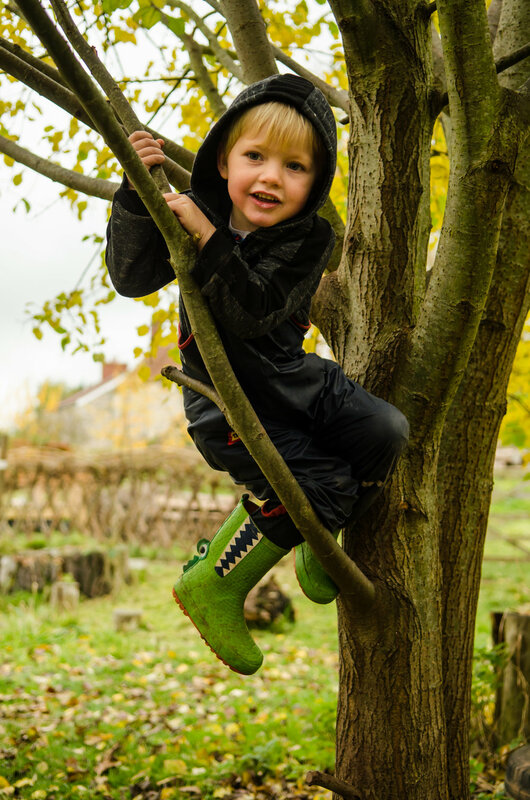 They will soon equate wetness underfoot with slipperiness, thin branches soon become unfavourable options when tree climbing and tall grass becomes a hiding place for tripping hazards. 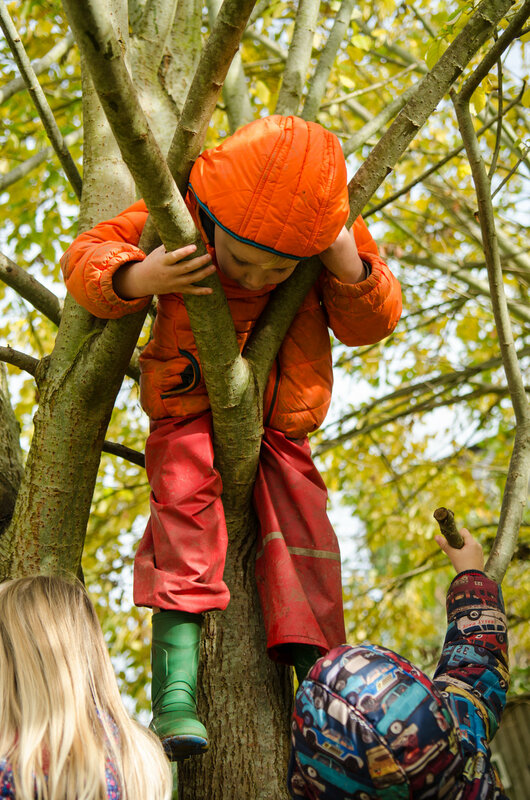 There is a risk however, that by continually pointing out hazards, the children can be put off from playing outdoors. But by talking it through with the children and scaffolding helpful strategies, as well as being close at hand, they are given the tools to achieve and a little boost of confidence and self-esteem when they have overcome something challenging. Next question: hand holding. I have no problem with hand holding. But I won't immediately offer one. "Help me!" is something we hear quite often when the children get a bit stuck or wobbly. If the children do ask, don't immediately offer a hand. First ask them, why they need your help and how you can help them, for example: "You look like you're struggling on that high beam, I wonder how you'd like me to help you?" This will get them thinking about the conditions they are finding tricky and between you and the child, you can problem solve how they could solve these sections. When risk assessing a session, I look at what benefit the children will get from leaving a hazard in place. If the benefit outweighs the risk, then it can stay, but sometimes it is best to put some form of control in place. For example, some of the stepping logs are like ice rinks when they are slippery. 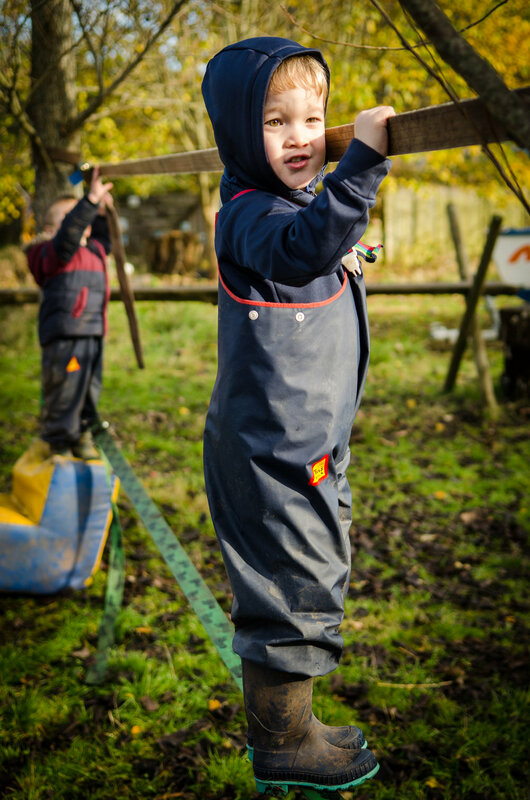 We attach chicken wire as a control because the only way the children want to navigate across them is by jumping from log to log! So why do all this? What's the point? Let's have another look at our frustrated anxious friend from earlier. He was stuck, he was anxious, he was cross. He didn't feel confident enough to get across the slippery log. He wanted help. He needed assistance. We talked it through. We got him moving. He crawled a little. He wobbled a little. He walked a little. He noticed more slippery logs. He verbally risk assessed as he travelled. He got to the end of the Timber Trail. He beamed a smile nearly bigger than his face could hold. And that's why we do it. Because it's about listening to a child's emotions and valuing them so that they improve their self-image. It means taking a child's worries and problem-solving alongside them. It means we can make children see themselves in a better, more confident light. 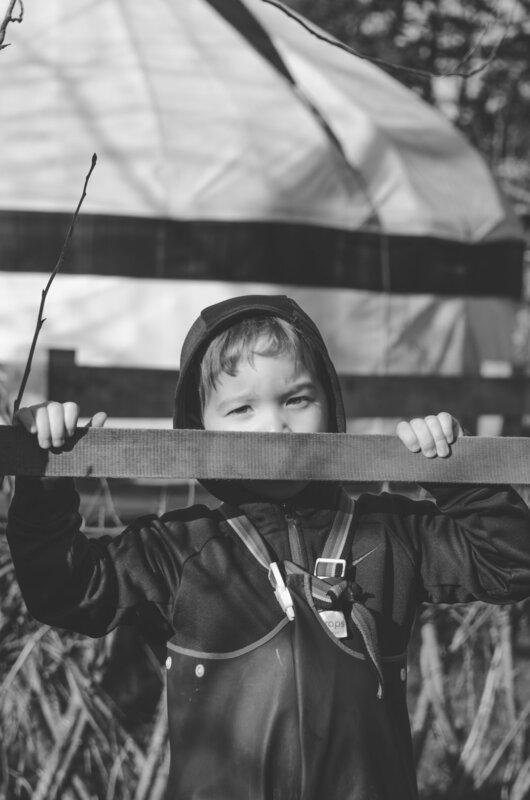 It means children start to model what the adults do, and offer assistance to their peers and ultimately means better times for the children and better play. None of the above is an immediate fix. 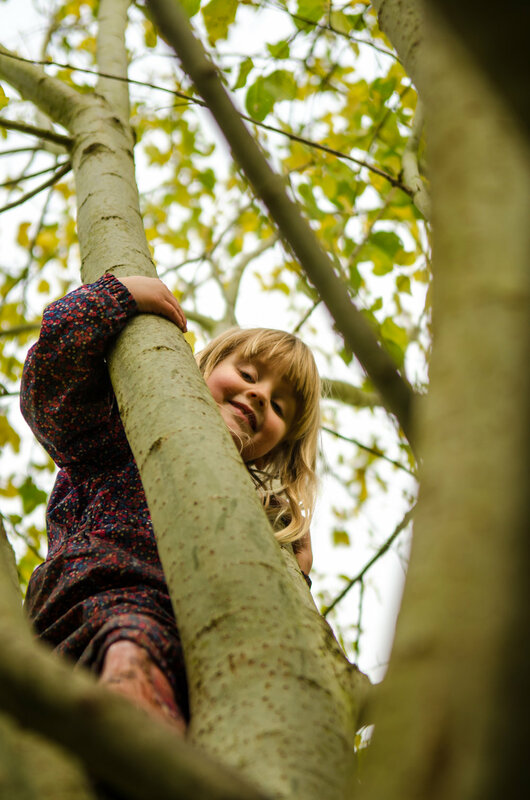 It’s about slowly transforming a child’s mentality towards their play but more importantly, themselves through regular outdoor access and play. So definitely worthwhile in our book. Try it with your children. See if it makes a difference to how they play and move!